All discussions regarding Board, Card, and RPG Gaming, including industry discussion, that don't belong in one of the other gaming forums. 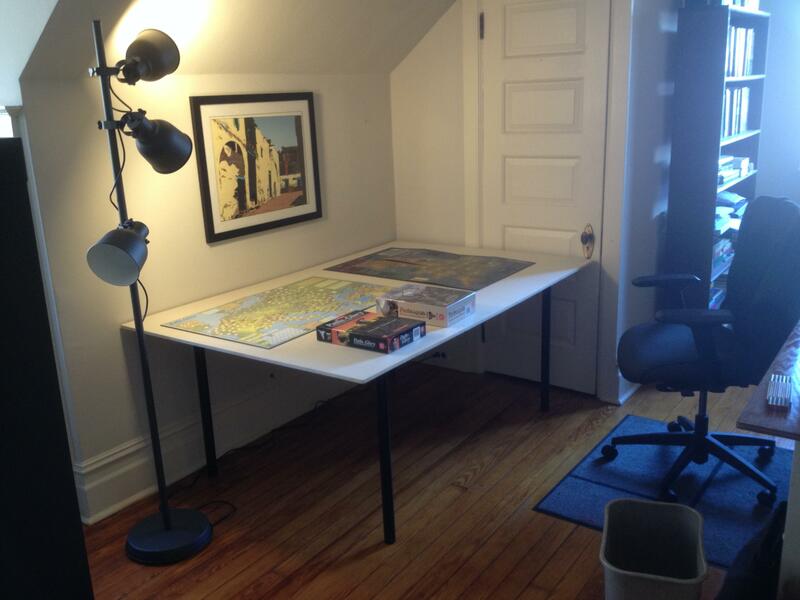 In the new house I finally have an office with room for a boardgame table! Long-term game space has been a lifelong dream. The components are nothing special: just a 46x70-inch quality plywood surface securely fitted with IKEA legs. It's white pine, sanded but not stained. At last, though, I have a table that can host two full games at once. I could even lay out a big four-map wargame (assuming four standard 34x22 maps rectangular) if I wanted. 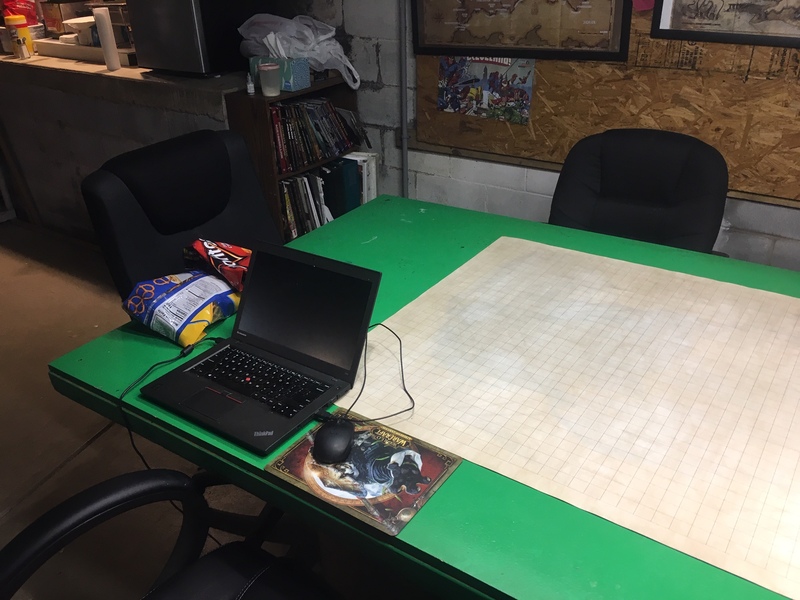 Until today, I've done my gaming on the dinner table (temporary and inconvenient) or a 2x3-foot folding surface inconveniently placed in the living room. My only concern is that I picked 1/2-inch thick wood. It was cheaper, and I guess I wanted to be able to move the table easily because it blocks a (deep-storage) closet door. There's no sag, but my worry is that it is just light enough to be easily bumped (shifting counters etc). I might decide to pick up another identical slab and screw it on top just for heft. In a any case, yay me! I've wanted this for a long time. I’ll be over this week with Fallout, Malifaux and Hordes tabletop wargames for the christening. My new table from boardgametables.com is assembled and waiting for shipping to be scheduled. I expect I'll have to bar the door on hepcat, if he figures out my new address. We use a 6' x 4' dining table from the 40's for our game room. And we're in the process of having a new surface for it built with supports that will make it 6' x 6'. Congrats Holman! That's a dream of mine as well, though it will have to wait until we get a bigger house. Right now I"m making do. 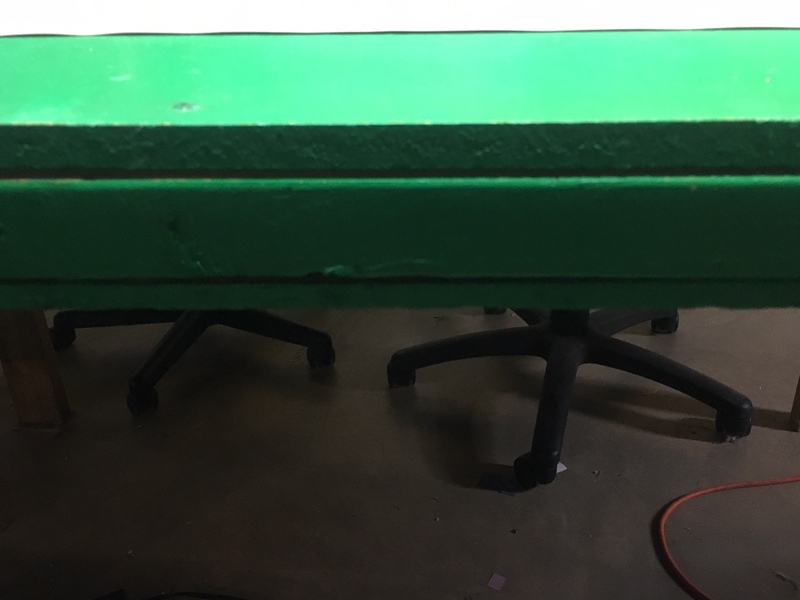 Late last year I took out my wife's old computer desk in the office which she didn't use anymore and replaced it with a large folding table. However, it's very sturdy - the kind they use for large events with two U shaped brackets for each end vs individual legs. So it doesn't wobble and is plenty big enough for even my biggest table hogs. I'm spoiled by my gaming group, though. One of the guys talked his boss into letting us use one of his company's conference rooms every week. 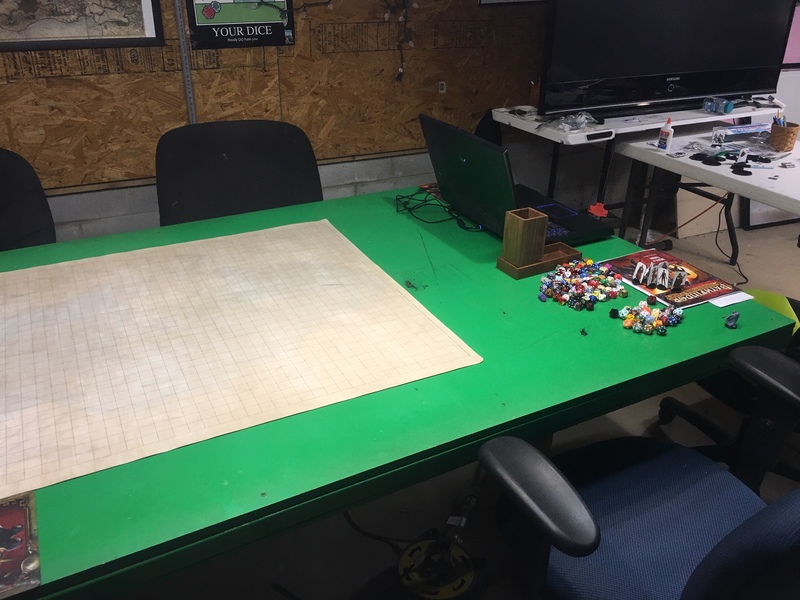 So we play on a large conference table with a giant $200 Quiver game mat on top (not mine). It definitely hurts when I have to come back home and play on my rinky dink contraption. 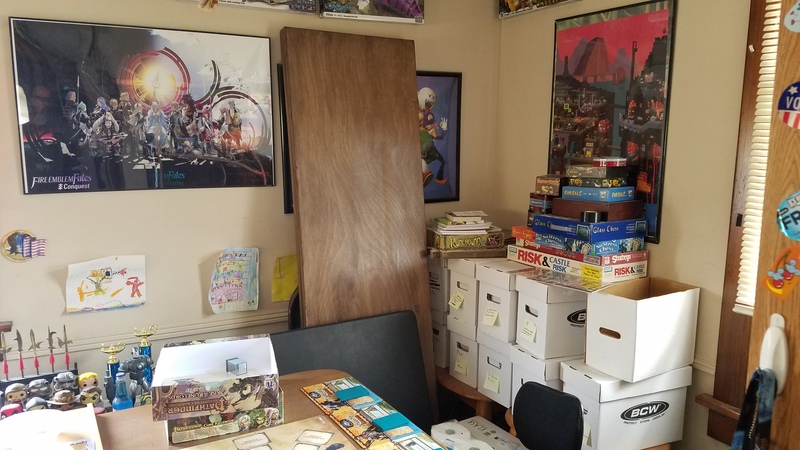 Now that the kids have moved in full-time, I've lost my board gaming table most of the time. We have an extra large table in their room, and I used to steal it for a week at a time while they were away. Now that they're back, it's always in use. I'm having a hell of a time playing anything. I built this awful looking table, but it is awesome for playing games. It is 4 ft x 8 ft, and I put it in my basement. No cutting on the plywood, just used it as it was. Basically, I took 2 sheets of plywood, and sandwiched them together with 2x4's in between to provide stability. Then I used 2x4's to make the legs. It works, but there are a lot of changes that I would do if I were to make a new table, and I think about doing it, but then I think that the table is working, so why throw it away and build something else. I also painted and varnished the top of the table, so it works nice and has a fairly good surface. My wife uses it to do her sewing and quilt making, so I have to evict her stuff whenever the gaming guys come over. Pictures! Even of the ugly one! That was my old gaming table. It was extremely functional. I now have a more normal sized (like 3.5 x 5.5) table in its place, and even that seems big for my space. I have no idea how I managed the 4x8 table now. I'm having trouble seeing the pictures in this thread. Keeping an eye on this thread. 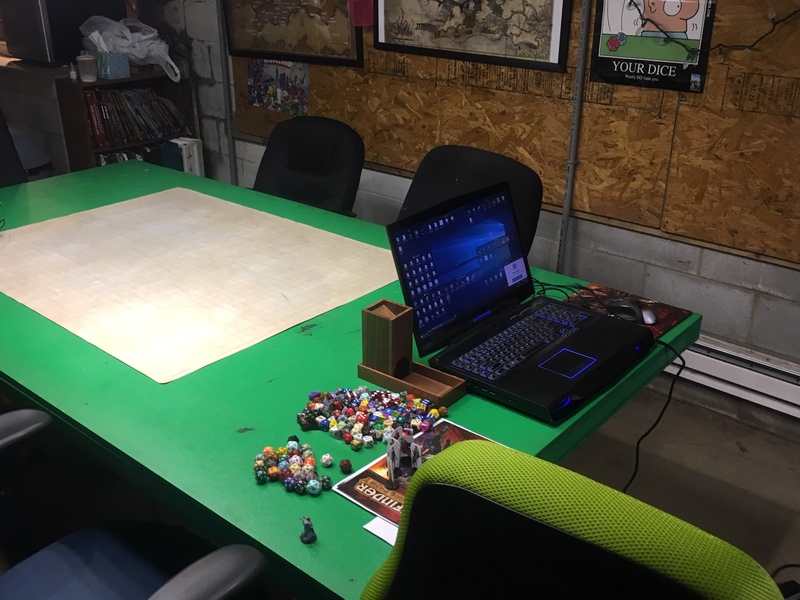 We are about to break ground on a new home and I specifically designed my office area to be big enough to include a game table. Based off of several posts I've seen on reddit, a table is totally doable even by someone with no prior experience. I am not 100% without experience so I look forward to designing and building! 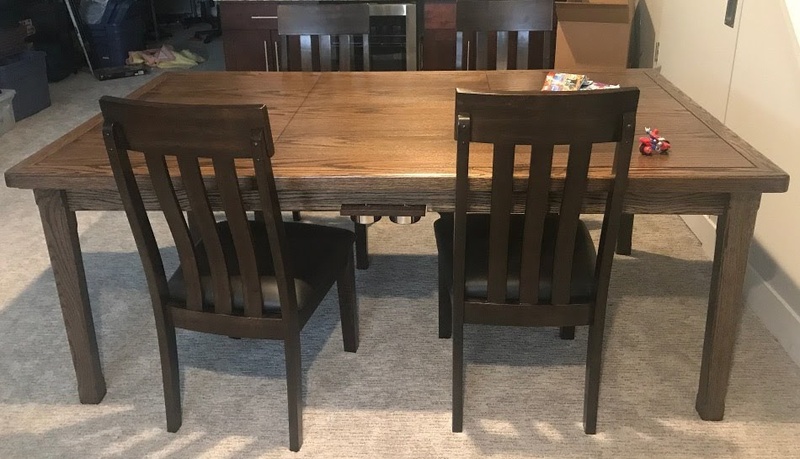 I ordered the 3.25 x 6 foot table from www.boardgametables.com and then 4 chairs from Ashley Furniture. There are built-in cupholders on the sides that pull out, and I can clip in another cupholder on the small ends. The removable GM station drops into the vault, and the top is cut into 3 pieces for easy removal. The table is in the basement of my new place, next to the bar that my wife has taken over for her home business. At least the cooler is within reach (after it's fixed). Not surprisingly, the kids have already used it more than I have. Dang! Zarathud that looks beautiful. 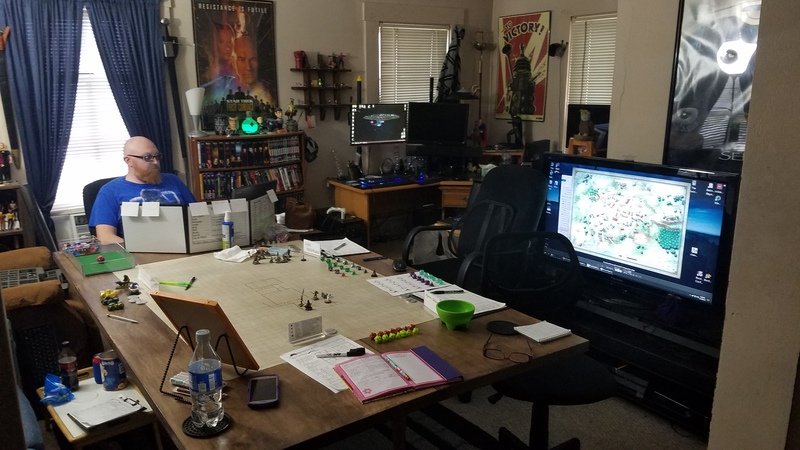 We currently game on our kitchen table and it gets the job done but when we move in a year and a half and finally buy a house I've informed my wife I'm getting a gaming table asap. She agreed. Very nice. Umm.. I have a refrigerator in the basement, for pop and stuff. I had a little one, and then found a dinged and dented one at Lowe's that was an apartment sized one, so picked that up on the cheap. So lots of places for drinks and dips and stuff. I don't have a lot of room. I have a two bedroom apartment built in the 19th century when rooms weren't large to begin with, and it's small for that. There isn't single storage closet in the house, just two bedroom closets. The bathroom is so small that I have to walk sideways to get through it, and not because I'm fat. This is housing two adults and two teenagers full time now, so to say I'm pinched for space is an understatement. Every square foot is precious - and used. My table is homemade. I got two half doors from Lowe's, the kind used in bi-fold closet doors. I probably paid $20 apiece for them. I laid them on the ground, hooked them together with a piano hinge, then gave them a few coats of stain/varnish. It folds up and stands in the corner of the kids room (next to their crap - and my comics! ), but takes up hardly any floor space, perhaps four inches by three feet. When we play, we set it on top of the table in the living room/dining room. It works beautifully, and we've run RPGs with eight people on it. Sorry about the clutter. We're still sorting things out from doubling the house population without increasing space. Very nice, and great use of space. I have a whole basement, and a large house, so never really worried about the need to conserve space. I have 6 bedrooms and three baths, and a full basement, and a bunch of acreage as well, so again no worries on space. But I really like the portability of your idea, and I assume those are hollow doors, so they are fairly light as well? Or are they solid wood? I really want to rebuild my table, but that takes some effort, and while I have learned a ton, and want to use that new knowledge, it is easier to stand pat with what I have then make new things. But I could use some of the tools I recently bought... Hmmm..
Nice map of Phandelver on the screen. Your table looks fine RMC for the downstairs space, and it's big. I have cupholders to avoid spills on the carpet, and the top so my wife/kids know when they can use it. You're only missing a lip to contain the dice. But if you to build, there are some good videos about how to build a vault area and even drop in a flatscreen. The table is hollow. It's awkward enough it really needs two to move it, and probably requires two to set it out, but it's light enough that I can move it while folded from room to room by myself, and I only have one good arm. The really nice thing about it is that I can place it on the dining room table (normally kept in the kids' room as in the first picture), or I can set it on the coffee table for a much lower version. 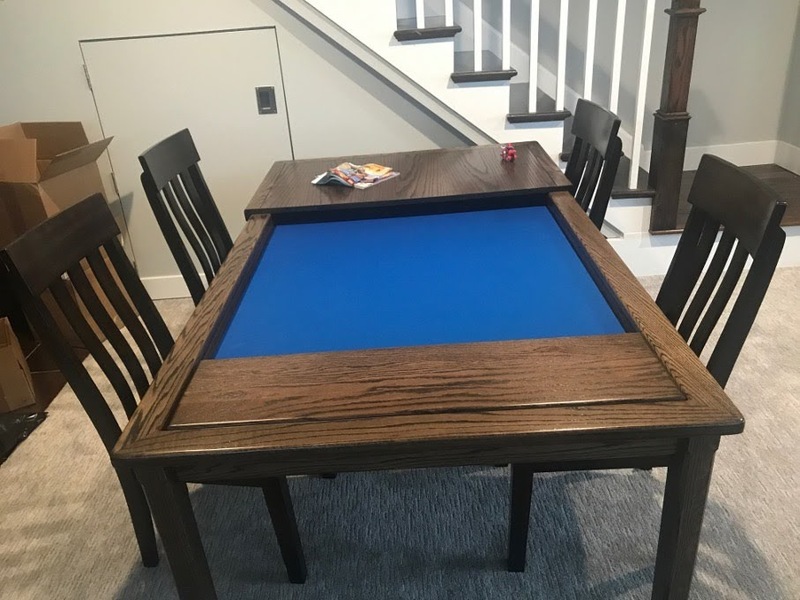 That means that with the coffee table in the living room and the dining table in the kids room, I have four separate table options (high table, low table, high large table, low large table) depending on the game being played. When I DM, I use a program called Map Tool, sort of a free version of Roll20/Fantasy Grounds. I set my laptop as the host and the TV computer as the client. I put in all of the maps and set up the fog of war in advance, then use a single token to represent the party. As they move around, I just move the token into the next room and reveal it. It beats the hell out of trying to graph-map whole dungeons, or repeating where the doors are thirty times. I also use it to display images of NPCs and enemies, and to show images of documents they find (which allows the whole table to read it at once instead of passing one copy around.) It takes a little while to get the hang of it, but I can do a two or three session map in an hour or so now. 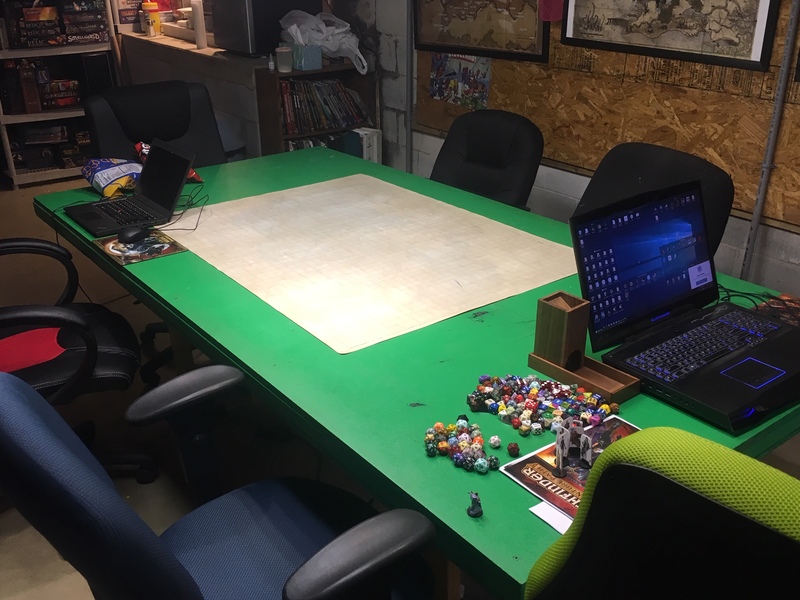 It's nothing fancy at all, and it's really only seatable on two sides, but for the first time I have a dedicated surface where I can leave long-term games up for weeks at a time. 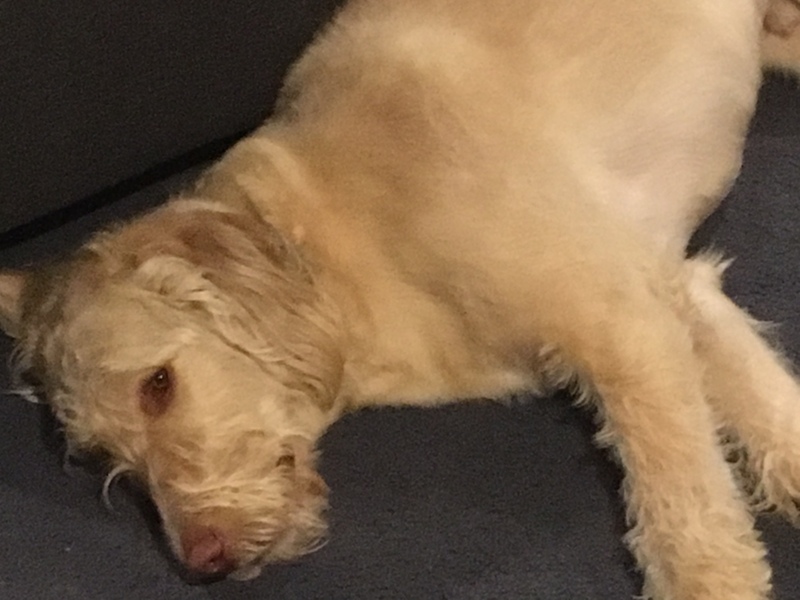 This is in my third-floor office, so there's no danger of human traffic bothering it, and the dog seems uninterested. The corner of my long computer desk is visible at right. I can do work and then spin around to think about ongoing games. The blocked closet is deep storage and very seldom accessed, but the table is easy to move.